Poom Prommachart’s debut recital has one of the most interesting programmes I’ve seen in years. It’s very serious and spiritual in nature, beginning with Liszt’s Bach variations, which are, as Prommachart points out in his booklet essay, a struggle with the recent death of his daughter. Liszt, Prommachart says, wanted desperately to keep his religious faith, but also wanted to blame God for his suffering. So this is a huge, often stark score, of nearly primeval emotional power, reminiscent of the Bach/Busoni Chaconne or the Franck Prelude, chorale, et fugue. Even bigger is Nikolai Medtner’s Improvisation No. 2. I’m waiting for my “breakthrough moment” with Medtner; he still seems, to me, like a gifted composer with a weakness for chaotic disorganization. That’s certainly true of this piece, which, true to its name, twists and turns for 27 minutes, going first in one direction and then another. They are mostly interesting directions, and many of the episodes are superb. The first is a gentle wintry song, the fourth (“Winged Dancers”) a superbly light Lisztian scherzo. The key to Improvisation No. 2 is that, despite its name, it is in fact a suite of character pieces, and while there are variations on a theme, the variations are so elaborate that tracing thematic development is a bit of a lost cause. It’s an intriguing work, but manage your expectations. He’s also impressive in the programme’s smaller works. I’m not sure Scriabin’s Messe noire has ever been the third-billed piece on a programme before, but it is suitably spooky here, especially since Prommachart has it undercutting the optimistic ending of the Liszt work. Having said that, Russian pianists in recent years - like Alexander Melnikov and Yevgeny Sudbin - have made me accustomed to an even greater level of demonic energy and violence. The Kreisler/Rachmaninov encore, Liebesfreud, is perfect. 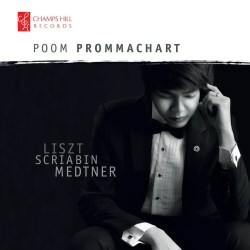 Champs Hill’s recorded sound is as good as ever, making this an excellent calling-card for a young pianist whose repertoire choices and performing skills are as intriguing as his name. It’s a highly attractive disc overall, especially if you like Medtner more than I do.